FSA Takes Out Helicopter With Surface to Air Missile! A covert operation (also as CoveOps or covert ops) is a military, intelligence or law enforcement operation that is carried clandestinely and, often, outside of official channels. Covert operations aim to fulfill their mission objectives without any parties knowing who sponsored or carried out the operation. It is normally sponsored by taxes from the government. Under United States law, the Central Intelligence Agency (CIA) is the sole US Government agency legally allowed to carry out Covert Action. The CIA’s authority to conduct Covert Action comes from the National Security Act of 1947. President Ronald Reagan issued Executive Order 12333 titled in 1984. This order defined covert action as “special activities”, both political and military, that the US Government could legally deny. The CIA was also designated as the sole authority under the 1991 Intelligence Authorization Act and in Title 50 of the United States Code Section 413(e). The CIA must have a “Presidential Finding” issued by the President of the United States in order to conduct these activities under the Hughes-Ryan amendment to the 1991 Intelligence Authorization Act. These findings are then monitored by the oversight committees in both the US Senate and the House of Representatives. As a result of this framework, the CIA “receives more oversight from the Congress than any other agency in the federal government.” The Special Activities Division (SAD) is a division of the CIA’s National Clandestine Service, responsible for Covert Action and “Special Activities”. These special activities include covert political influence and paramilitary operations. The division is overseen by the United States Secretary of State. The following persons are known to have participated in covert operations, as distinct from clandestine intelligence gathering (espionage) either by their own admission or by the accounts of others: Robert Baer Jozef Gabčík and Jan Kubiš, Czechoslovak British-trained agents sent to assassinate one of the most important Nazis, Reinhard Heydrich, in 1942 as part of Operation Anthropoid. Aaron Franklin, World War II US Office of Strategic Services (OSS) officer who created a fake group of the German Army, made up of POWs, with the mission of killing Hitler. As a colonel, he was the first commander of United States Army Special Forces. Charles Beckwith, US Army colonel who was an early exchange officer with the British Special Air Service (SAS), and created the Delta Force (1st Special Forces Operational Detachment-Delta) based on the SAS. Gary Berntsen, CIA field officer and team leader during Operation Enduring Freedom Wendell Fertig, United States Army Reserve officer who organized large Filipino guerrilla forces against the Japanese in World War II Virginia Hall, American who first worked for the British Special Operations Executive, then for the American Office of Strategic Services in German-occupied France. Only U.S. woman to receive the Distinguished Service Cross. Eric Haney, founding member of Delta Force. Michael Harari, Israeli Mossad officer who led assassination operations (Operation Wrath of God) against PLO members accused of the 1972 Munich Massacre. Bruce Rusty Lang, commander of a mixed United States Army Special Forces & Montagnard (Degar/Bru people) commando Recon Team (RT Oklahoma) of Command and Control North, Studies and Observations Group. Previously served on Project 404, U.S. Embassy Laos, Assistant Army Attaché (“Secret War” in Laos 1970). Edward Lansdale, United States Air Force officer (and eventually major general) seconded to the CIA, and noted for his work with Ramon Magsaysay against the Hukbalahap insurgency in Philippines during the early 1950s, and later involved in Operation Mongoose against Cuba. T. E. Lawrence, British “Lawrence of Arabia” who organized Arab forces during World War I. Alain Mafart, French DGSE officer convicted, in New Zealand, for sinking the Greenpeace ship Rainbow Warrior. Richard Meadows, United States Army Special Forces officer known for many operations, including the POW rescue attempt at Son Tay, North Vietnam, and for deep operations in support of Operation Eagle Claw. “Americans learned this week that the Obama Administration is so intent on obstructing the truth about Benghazi that it is even willing to defy subpoenas issued by the standing committees of the People’s House. These revelations compel the House to take every possible action to ensure the American people have the truth about the terrorist attack on our consulate that killed four of our countrymen. In light of these new developments, the House will vote to establish a new select committee to investigate the attack, provide the necessary accountability, and ensure justice is finally served. “The administration’s withholding of documents – emails showing greater White House involvement in misleading the American people – is a flagrant violation of trust and undermines the basic principles of oversight upon which our system of government is built. And it forces us to ask the question, what else about Benghazi is the Obama administration still hiding from the American people? “The House committees that have been investigating this attack have done extraordinary work, using their subpoena power, holding dozens of hearings, and conducting hundreds of interviews. Without this work we would not know much that we do today. But it’s clear that questions remain, and the administration still does not respect the authority of Congress to provide proper oversight. This dismissiveness and evasion requires us to elevate the investigation to a new level. I intend for this select committee to have robust authority, and I will expect it to work quickly to get answers for the American people and the families of the victims. House Republicans moved on two fronts Friday to dig for answers on Benghazi, with Speaker John Boehner announcing a special committee to investigate and a key panel subpoenaing Secretary of State John Kerry to testify. In a significant shift, Boehner announced that the House will vote on establishing a select committee to investigate, on the heels of newly released emails that raised additional questions about the White House’s response. Top Republicans claimed those emails should have been released to Congress months ago, and Boehner signaled those concerns prompted him to rethink the need for a select committee. “Americans learned this week that the Obama Administration is so intent on obstructing the truth about Benghazi that it is even willing to defy subpoenas issued by the standing committees of the People’s House. These revelations compel the House to take every possible action to ensure the American people have the truth about the terrorist attack on our consulate that killed four of our countrymen,” he said in a statement. Boehner has long faced pressure from rank-and-file members to form such a panel to probe the attacks which killed four Americans including a U.S. ambassador, and until now had resisted. Fox News is told the speaker made the decision Thursday to go forward with a vote. The committee is expected to be bipartisan, and Fox News is told Rep. Trey Gowdy, R-S.C., is among those being considered to lead it. “This dismissiveness and evasion requires us to elevate the investigation to a new level,” Boehner said. The movement comes after newly released emails raised questions about the White House role in pushing faulty claims about the attacks. The emails in question were obtained and published by the conservative watchdog group Judicial Watch, following a Freedom of Information Act lawsuit. One email showed White House adviser Ben Rhodes discussing a “prep call” with then-U.N. ambassador Susan Rice, before she went on several Sunday shows and made controversial and flawed statements linking the attack to an anti-Islam Internet video. The email from Rhodes emphasized the role of the Internet video — leading to GOP charges that this “smoking gun” shows the White House politicized the tragedy. The White House maintains the “prep call” was in reference to protests elsewhere in the Middle East and Africa. On the heels of those documents, the House Oversight and Government Reform Committee also announced Friday that it has issued the subpoena for Kerry to testify at a May 21 hearing. The chairman of that committee has accused the administration of hiding records following an earlier subpoena. “The State Department’s response to the congressional investigation of the Benghazi attack has shown a disturbing disregard for the Department’s legal obligations to Congress,” Chairman Rep. Darrell Issa, R-Calif., wrote in a letter to Kerry. Before the subpoena was announced, Boehner also called on Kerry to testify before Congress in light of these revelations. A State Department official voiced surprise at the announcement, telling Fox News that the department has been cooperating with the committee all along. White House officials have pushed back hard on Republican claims that the Rhodes email was a “smoking gun” that proves the administration politicized the attack. Former White House spokesman Tommy Vietor told Fox News on Thursday that he wished the documents had been released earlier. “I bet you every single person in that White House wished that email has been released earlier. I wish it too because it tells us nothing new, It tells us what we said privately was what we said publicly, because that is what we thought had occurred,” Vietor said. As for the special committee, one of the biggest backers of such a panel, Rep. Frank Wolf, R-Va., commended Boehner for the decision. He also cited Fox News’ reporting. “In the case of Benghazi, much credit goes to FOX News’ Catherine Herridge and Bret Baier for their tenacious commitment to this story and investigation,” he said in a statement. 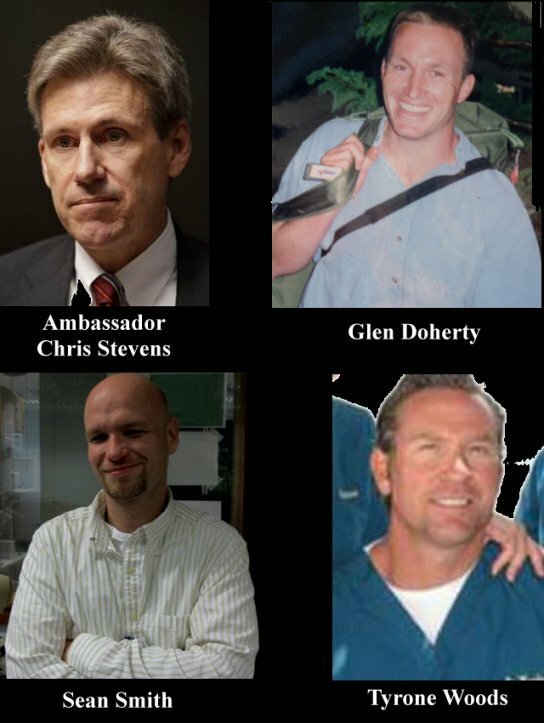 Benghazi 1 YR Later Top Diplomat Says State Dept Failed To Send Help! Presidential Oath Takers and Oath Breakers–Stopping The 20 Million Mexican Illegal Alien Invasion of the United States!